Khat atau kaligrafi (dari bahasa Greek κάλλος kallos "cantik" + γραφή graphẽ "tulisan") ialah sejenis seni visual. Ia sering digelar seni dalam penulisan (Mediavilla 1996: 17). Takrifan semasa bagi amalan khat adalah "seni bagi memberi bentuk bagi tanda dalam bentuk gambaran, harmoni dan kemahiran" (Mediavilla 1996: 18). Kisah penulisan merupakan satu evolusi kecantikan estetik dibingkai dengan kemahiran teknikal, kepantasan penyampaian dan kekangan material seseorang, masa dan tempat (Diringer 1968: 441). Gaya penulisan digelar skrip, atau huruf (Fraser and Kwiatkowski 2006; Johnston 1909: Plate 6). Khat moden berbeza antara gambaran huruf tangan dan reka bentuk berfungsi kepada hasil seni halus di mana gambaran abstrak tanda tulisan tangan mungkin atau tidak dikaburkan tulisannya (Mediavilla 1996). Khat klasik berbeza dari tipograf dan tulisan tangan klasik-baru, melalui khat mungkin mencipta semua ini; huruf berdisplin segi sejarah akan tetapi mengalir dan spontan, diperkemas ketika menulia (Pott 2006 and 2005; Zapf 2007 and 2006). Seni khat terus berkembang dalam bentuk jemputan perkahwinan dan majlis, reka bentuk fon/tipografi, reka bentuk tulisan tangan asal logo, seni keagamaan, pengumuman/reka bentuk grafik/khat ditempah, ukiran tulisan batu dan dokumen peringatan. Ia juga digunakan sebagai prop dan iemj bergerak bagi filem dan televisyen, persaksian, sijil kelahiran dan kematian/peta, dan hasil kerja lain yang membabitkan penulisan (sebagai contoh lihat Letter Arts Review; Propfe 2005; Geddes and Dion 2004). Rencana ini memerlukan kemaskini dalam Bahasa Melayu piawai Dewan Bahasa dan Pustaka. Sila membantu, bahan-bahan boleh didapati di Calligraphy (Inggeris). 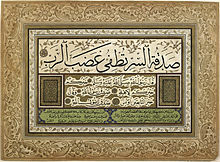 Kaligrafi Barat dapat dikenali dengan penggunaan abjad Rumi, yang terbit daripada abjad Phoenicia, abjad Yunani, dan abjad Etruska. Abjad Rumi mula-mula muncul lebih kurang pada tahun 600 SM di Rom, dan pada kurun pertama Masihi berkembang menjadi huruf besar Romawi yang dipahat pada batu, huruf besar kasar yang dicat pada dinding, dan tulisan sambung Romawi yang digunakan bagi penulisan seharian. In the second and third centuries the Uncial lettering style developed. As writing withdrew to monasteries, uncial was found more suitable for copying the Bible and other religious texts. It was the monasteries which preserved the calligraphic traditions during the fourth and fifth centuries, when the Roman Empire fell and Europe entered the Dark Ages. At the height of the Roman Empire its power reached as far as Great Britain; when the empire fell, its literary influence remained. The Semi-uncial generated the Irish Semi-uncial, the small Anglo-Saxon. Each region seems to have developed its own standards following the main monastery of the region (i.e. Merovingian script, Laon script, Luxeuil script, Visigothic script, Beneventan script), which are mostly cursive and hardly readable. The rising Carolingian Empire encouraged setting a new standardized script, which was developed by several famous monasteries (including Corbie Abbey and Beauvais) around the eighth century. The script from Saint Martin of Tours was ultimately set as the Imperial standard, named the Carolingian script (or "the Caroline"). From the powerful Carolingian Empire, this standard also became used in neighboring kingdoms. In the eleventh century, the Caroline evolved into the Gothic script, which was more compact and made it possible to fit more text on a page. The Gothic calligraphy styles became dominant in northern Europe; and in 1454 AD, when Johannes Gutenberg developed the first printing press in Mainz, Germany, he adopted the Gothic style, making it the first typeface. Calligraphy in a Latin Bible of AD 1407 on display in Malmesbury Abbey, Wiltshire, England. This bible was hand written in Belgium, by Gerard Brils, for reading aloud in a monastery. In the sixteenth century, the rediscovery of old Carolingian texts encouraged the creation of the Antiqua script (about 1470). The seventeenth century saw the Batarde script from France, and the eighteenth century saw the English script spread across Europe and world by their books. The contemporary typefaces found on every computer, from simple word processing programs like Microsoft Word or Apple Pages to professional designer's software packages like Adobe InDesign, owe a considerable debt to the past and to a small number of professional typeface designers today (Zapf 2007; Mediavilla 2006; Henning 2002). Sacred Western calligraphy has some special features, such as the illumination of the first letter of each book or chapter in medieval times. A decorative "carpet page" may precede the literature, filled with ornate, geometrical depictions of bold-hued animals. The Lindisfarne Gospels (715-720 AD) are an early example (Brown 2004). As with Chinese or Arabian calligraphies, Western calligraphic script had strict rules and shapes. Quality writing had a rhythm and regularity to the letters, with a "geometrical" order of the lines on the page. Each character had, and often still has, a precise stroke order. Unlike a typeface, irregularity in the characters' size, style and colors adds meaning to the Greek translation "beautiful letters". The content may be completely illegible, but no less meaningful to a viewer with some empathy for the work on view. Many of the themes and variations of today's contemporary Western calligraphy are found in the pages of the Saint John's Bible. The history of the slavonic and consequently Russian writing systems differs fundamentally from the one of the Latin language. The principal tools for a calligrapher are the pen, which may be flat- or round-nibbed, and the brush (Reaves and Schulte 2006; Child 1985; Lamb 1956). For some decorative purposes, multi-nibbed pens—steel brushes—can be used. However, works have also been made with felt-tip and ballpoint pens, although these works do not employ angled lines. Ink for writing is usually water-based and much less viscous than the oil based inks used in printing. High quality paper, which has good consistency of porosity, will enable cleaner lines,[petikan diperlukan] although parchment or vellum is often used, as a knife can be used to erase work on them and a light box is not needed to allow lines to pass through it. In addition, light boxes and templates are used to achieve straight lines without pencil markings detracting from the work. Ruled paper, either for a light box or direct use, is most often ruled every quarter or half inch, although inch spaces are occasionally used, such as with litterea unciales (hence the name), and college ruled paper acts as a guideline often as well. Anderson, D. M. (2008), Indic calligraphy, Encyclopedia Britannica 2008 . Brown, M.P. (2004) Painted Labyrinth: The World of the Lindisfarne Gospel. Revised Ed. British Library. Child, H. ed. (1985) The Calligrapher's Handbook. Taplinger Publishing Co.
Geddes, A., & Dion, C. (2004) Miracle: a celebration of new life. Photogenique Publishers Auckland. Lamb, C.M. ed. (1956) Calligrapher's Handbook. Pentalic 1976 ed. Mediavilla, Claude (2006) Histoire de la Calligraphie Française. Albin Michel, France. Reaves, M., & Schulte, E. (2006) Brush Lettering: An instructional manual in Western brush calligraphy, Revised Edition, Design Books New York. Pengertian Seni khat dalam Wikikamus bahasa Melayu, sebuah kamus bebas. Islamic calligraphy in the Library of Congress, Washington D.C.
Tibetan: Tibetan Calligraphy - How to write the script. Centro Internazionale Arti Calligrafiche – it. Associazione Calligrafica Italiana (ACI) - it. Laman ini diubah buat kali terakhir pada 01:56, 7 April 2015.